The Los Angeles Rams were able to outlast the New Orleans Saints at the L.A. Coliseum on Sunday, winning 26-20. QB Jared Goff and RB Todd Gurley led an efficient offensive effort and kept Los Angeles ahead for the entire game. Goff went 28-of-43 for 254 yards and threw two touchdowns versus one interception that WR Sammy Watkins tipped to the defense. Gurley had 17 carries for 74 yards. Watkins and WR Josh Reynolds were on the receiving ends of Goff’s touchdown throws and WR Cooper Kupp went over 100 yards receiving for the game. QB Drew Brees went 22-of-32 for 246 yards and a lone touchdown, but he also launched several dangerous throws. RB Alvin Kamara flashed his big play potential, scoring a 74-yard touchdown run late in the first quarter. Kamara added 101 yards receiving and a receiving touchdown as well. However, the Saints were ultimately unable to stop the Rams offense consistently enough to get their own offense enough opportunities. With that, we give you our PFF-exclusive takeaways from the contest for each team. The Rams’ passing offense did a fantastic job of creating favorable matchups and Goff executed well all afternoon. He missed on a handful of throws, including his interception, which was underthrown but not of the “turnover-worthy” variety, but the story of the game was Goff’s ability to spread the ball around, as eight different receivers caught passes for 353 yards. He went 7-for-11 for 110 yards at the intermediate (10-19-yard) level and he hit on three deep (20-plus yard) passes on seven attempts, good for another 122 yards. It was one of Goff’s better games of the season and a much-needed effort to help the Rams maintain control in the NFC West. Gurley’s 74 rushing yards were his largest total since Week 7, as he ran efficiently while picking up 52 of his yards after contact (3.1 yards after contact per attempt). He did just as much damage in the passing game, forcing five missed tackles on his four receptions, totaling 54 yards. Putting it all together, Gurley finished with an excellent elusive rating of 116.5 for the game. The Rams linebackers struggled to cope with the Saints, and in particular Alvin Kamara, out of the backfield. Ogletree did have some big plays in the game, including breaking a pass up and almost seeing that deflection picked off, but he missed a couple of tackles and was just not close to being able to tackle Kamara in space on too many occasions. The Rams were able to do a pretty good job against Drew Brees, who had an unusually poor day by his standards, and they could have really put this game out of sight if they’d come down with any one of three dropped interceptions. Webster was thrown at six times, breaking up two of them and allowing just 14 yards into his coverage overall. 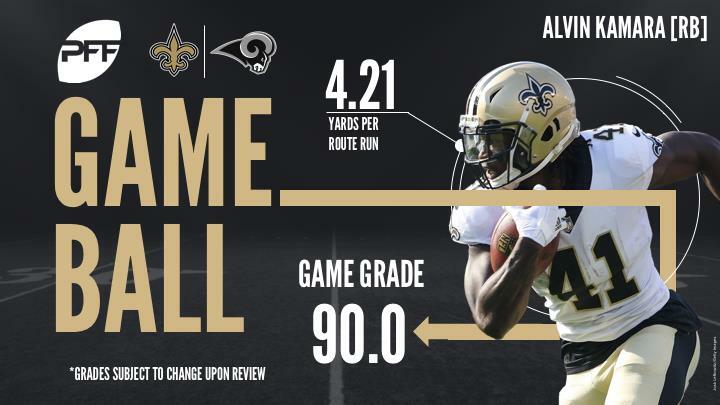 No rookie back has been as good as Alvin Kamara over the past few weeks. In fact no running back in the league, rookie or otherwise, has been able to match his grade over the past month of the season. In this game he was phenomenal, breaking nine tackles on just 11 touches and gaining 188 yards of offense from those touches. Going up against the Rams defensive front, this was a huge game for Max Unger, who has now put together three straight games of impressive play after he began the season with one of the worst stretches of play in his career. He had a perfect day in pass protection – his second in three weeks – and had some impressive plays in the run game, executing reach blocks on Rams defensive linemen and getting to the second level to cut off linebackers. Vaccaro’s return to the lineup was an ugly one, as he was targeted five times in coverage, allowing five catches for 83 yards, not including a defensive hold that prolonged a drive on 4th-and-1 and a facemask penalty. Vaccaro did his usual fine work around the line of scrimmage against the run, but it wasn’t enough to overcome his struggles in coverage as the Rams put him in challenging positions schematically and he was unable to keep up. Jordan did his best to keep the Saints in the game with two sacks, four hurries, and two batted passes on his 50 rushes. He was a key part of giving Rams LT Andrew Whitworth his worst game of the season, beating him for multiple quick wins in the pass game, including a sack and two pressures. Jordan’s four total stops tied for the team lead and he was the only Saints’ defensive lineman to play all 77 snaps.